Although there is no such thing as an official FAA Airworthiness Directive for a homebuilt, the SDR's should be considered as such. Besides killing yourself, you could ruin a perfectly good airplane and give the rest of us and the T-18 bad publicity, and we just really don't need that. So check your airplane and comply with the mandatory SDR's. These SDR's also apply to the S-18. Please understand that the current revision of the T-18 drawings, and the current drawings for the S-18 have included the SDR updates. If you do not have the current set of drawings … you should get them. This Page also contains a handy checklist for those who are thinking of purchasing a T/S-18. The checklist will give you an idea of the things to look for and the problem areas for the Thorp aircraft. 1. Horizontal Tail Spar Doubler- Refer to T-18 drawing B-502, Newsletters# 27 and 39. The original horizontal tail main spar as shown on drawing A-502 (obsolete) was made up of a single 2.0" X 0.083" 2024 T3 aluminum tube. Referring to drawing B-502 (current), the main spar tube was changed to .049" wall thickness, and calls for a second tube (B-502-7) with a 0.71" wall thickness to be inserted inside the main tube, and to extend 17.5 inches each side of center (BL 0). There are two ways to verify that this SDR mod has been completed. The first way is to drill out one rivet on the underside of the horizontal tail assembly about 10 inches from the center line. Using a piece of safety wire or similar material, with a 90 degree bend on one end … insert the bent end into the rivet hole and pull the bend so it contacts the inside surface of the tail spar tube. Mark the wire even with the outer skin surface, then remove the wire and measure the distance from the mark to the bend surface on the wire. This will be the combined thickness of the stabilator skin and the spar. If the modification has been completed you should measure a total thickness of .145 inches (.025 skin thickness + .049 tube wall + .071 inner tube wall) If you measure only .108 inches then you have the original spar without the SDR Modification. The second method requires you to remove the stabilator tip and the end rib … then using a flashlight you can look inside the tail spar tube and see if the inner tube has been installed. 2. 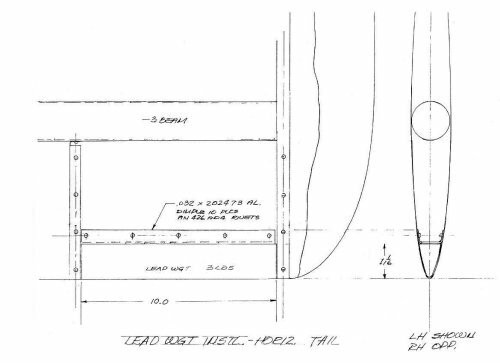 Horizontal Tail Mast Stiffener- Refer to T-18 Drawing A-510, Newsletters# 27 and 39. The mast assembly is located at the center line (BL 0) of the stabilator and supports part of the counterbalance weight. This SDR calls for an additional 2024 T3 aluminum stiffener (A510-6) with a thickness of .06 inches to be installed on both sides of the assembly. 4. Stabilator Counter Balance Weights- Refer to T-18 Drawing A-510, C-595, -623, Newsletters# 27, 39 and 40. This SDR refers to the the lead weights used to counter balance the stabilator. The original tail had all of the lead weight installed on the center mounted horizontal tail mast (refer to item 2 above). This was revised in 1968. Basically the weight was split into thirds, with about 2.2 pounds remaining mounted to the horizontal tail mast. The remaining weight was then cut in half and added to each tip of the stabilator. In the early versions the tip weight was installed externally in the form of bullets, with each bullet weighing 3 pounds. These are really easy to see and many T-18 are flying with these external tip weights. At some point the tip weights were molded to fit the leading edge curve and were installed inside the stabilator tips, and weigh about 3 pounds each. These are a little harder to verify, but there is usually some external evidence of their presence in the form of rivets or screws that are used to secure the lead weights into the leading edges. If nothing is evident then you may need to remove the stabilator tip and end rib to verify that the internal weights are present. Click here for a drawing of a typical internal weight installation. 1. 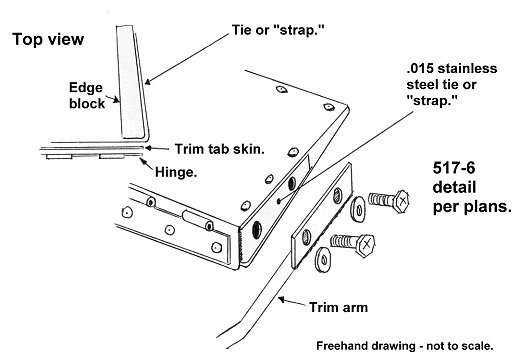 Aileron Hinge Doubler- Refer to T-18 Drawing A-539, Newsletter# 14. Some folks have had problems with the rear spar (beam) cracking at the aileron hinge point. It is generally believed that this cracking is due from the bend radius in the beam being too tight. This modification entails placing a bent up angle doubler made from .025 or .032 2024 T3 aluminum. It is riveted between the aft spar beam and the underside of the hinge stock. This is now shown in the current revision of the drawings. 2. Extra Rivets Added To Nose Ribs- Refer to T-18 Drawing A-532, Newsletter# 14. There was an early problem with some of the rivets forward of the spar in the center wing becoming loose. The original rivet spacing was 2 inches. John Thorp suggested to shorten the rivet spacing to 1 inch, which basically meant that we added a rivet between each of the original ones. This is now shown in the current revision of the drawings. 3. Extra Rivets Added To Main Spar- Refer to T-18 Drawing A-532, -537, Newsletter# 49. There have been some problems with the rivets attaching the center wing skin to the main spar working loose over time. It was advised to add a second row of rivets attaching the wing skin to the main spar aft of the original row, equally spaced between the original rivet locations, out to BL 35.25 on both the top and bottom of the center wing. 4. Flap Travel Limited- Refer to T-18 Newsletter# 34. The original flap drawings called for a 40 degree flap deflection. In early testing it was found that some T-18's with a forward CG would demonstrate a "bunt" when full flaps were deployed between 100 and 120 mph.. This bunt would result in a severe and instantaneous nose down condition. At low altitude this could cause a problem. John Thorp thought the condition was caused by a horizontal tail stall due to high tail loading, and bad airflow across the tail from the wing wake. He advised that all T-18's should limit their flap travel to 30 degrees. Note that not all T-18's displayed this bunt tendency. Later, it was discovered that by blocking the underside of the aft wing root fairings, by installing a "floor", seemed to cure the problem. Other builders have seemed to solve the bunt by installing a "gap" seal on the under side of the flaps. This changes the airflow around the flap as the airflow can no longer go through the slot .. but seems to stop the bunt. Please note that even with the fixes mentioned above .. it is still advised to limit the flap travel to 30 degrees. 5. Fuselage Skin Stiffener- Refer to T-18 Drawings -580, A-580, A-580-16, C-580, Newsletter# 12. On the first three T-18's, cracking was found at the upper forward corners of the main spar cutout in the fuselage skins. This was caused by the fatigue stresses set up during taxing. A .063 inch 2024 T3 doubler is added to either the inside or outside of the fuselage, and extends up 5 rivet holes, down 5 holes, forward 2 holes, and aft 2 holes from the upper front corner of the spar cutout. This in now shown in the current revision of the drawings. 6. Electric Flaps- Electric Flaps have gained popularity over the last several years. Lots of work has been done to reduce the size of the tunnel, and getting rid of the tunnel mounted flap handle and associated hardware makes the job easier. There are several methods and variations of the flap motor installation, but all of them retain the original flap cable design and merely use the flap motor to replace the flap handle action. The T-18 newsletters have tons of information on electric flap installations. 7. Elecrtic Trim- Both electric pitch and roll trim has been incorporated on T-18's and both work extremely well. Pitch trim is usually accomplished by installing a slow RPM (7-12) motor on the bulkhead just ahead of the trim jackscrew assembly, and connecting it to the jackscrew by means of a flexible drive shaft. Roll trim is normally set up using a MAC type servo mounted inside the aileron driving a dollar bill sized trim tab on the aileron trailing edge. Other methods have been used in both trim applications and are well documented in the T-18 newsletters. 8. Fuel Shutoff Valve- It is advised that you not screw the fuel shutoff valve directly into the bottom of the fuel tank. The stresses imposed when actuating the valve may cause the mounting flange in the bottom of the fuel tank to crack. 9. Fuel Tank Support- Refer to T-18 Newsletter# 12. It was necessary to provide a stress carry-through from the -528 tank support to the dash frame. This was accomplished by making an angle bracket from .063 inch extrusion, or bent up from sheet stock and attaching to the dash with 2 1/8" rivets and to the 528-2 with 2 rivets. 528-4 was extended all the way to the dash. This is now shown in the current revision of the drawings. There were some problems in applying the right brake when full right rudder was applied. Some builders have notched the fuel tank supports to clear the brake pedals. For this modification refer to T-18 Newsletter# 60. 10. The LDS Airfoil- In 1974 Lu Sunderland developed the folding wing which also incorporated a revised airfoil. The new airfoil was advertised to lower the stall speed between 5 and 10 miles per hour while not affecting the cruise performance at all. This airfoil was used on the T-18C, is used on all S-18 models and is now being used on many new T-18's that are currently being built, and is known as the LDS or Sunderland airfoil. 11. Moving The Instrument Panel Aft- Many T-18 builders choose to relocate the instrument panel aft of the original drawings location. This is usually done to prevent some of the longer instruments from hitting the fuel tank. The distance varies according to the builder but is usually somewhere between 3 and 5 inches. 13. Tunnel Modifications- In the standard T-18 the center tunnel runs from the firewall to the rear of the baggage compartment, and houses the stabilator push pull tube, the rudder cables, the manual trim assembly, and the flap handle. Some folks thought that the tunnel was always in the way and took up valuable space in the hip area. Many modifications have been made to the tunnel and you are likely to see quite a variation among builders. Some have opted for electric pitch trim and electric flaps, which enabled them to remove the manual trim and flap handle. Others have relocated the rudder cables to the outer walls of the fuselage and have been able to both lower and narrow the tunnel assembly. With the rudder cables moved out of the tunnel there seemed no need for it to extend to the firewall, so many have simply eliminated the tunnel from the walking beam forward to the firewall. With ALL of these modifications the tunnel is considerable shorter and narrower, and seems to disappear between the seats, which seems to make the cabin wider and more comfortable. 14. Stall Strips- Stall strips are used on many airplanes, including many production models like the Mooney and Piper Cherokee's. They provide a means of customizing the stall and/or the stall warning characteristics. Like most high performance homebuilts, the T-18 has a fairly abrupt stall with little warning. Stall strips applied in the correct location to the leading edge of the inboard wing will cause some airflow disturbance before the stall. This disturbed airflow is audible and is felt in the stick by a nice stick shake and give an excellent pre-stall warning. Stall strips are not a mandatory modification and you will not see them on every Thorp. They are typically made from 3/8" X 3/8" aluminum angle about 5 inches long, and will be attached by screws or rivets. Refer to Newsletter# 82 (for the standard wing) or Newsletter# 91 (for the Sunderland wing).